Barbara G.Tarn had an intense life in the Middle Ages that stuck with her through the centuries. She prefers swords to guns, long gowns to mini-skirts, and even though she buried the warrior woman, she deplores the death of knights in shining chainmail. She likes to think her condo apartment is a medieval castle, unfortunately lacking a dungeon to throw noisy neighbors and naughty colleagues in. Also known as the Lady with the Unicorns, these days she prefers to add a touch of fantasy to all her stories, past and present – when she’s not wandering in her fantasy world of Silvery Earth or in her Star Minds futuristic universe. 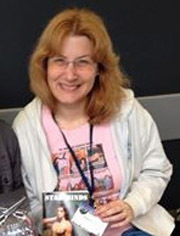 She’s a writer, sometimes artist, mostly a world-creator and storyteller – stories comprise shorts, novels and graphic novels. Her novella “The Hooded Man” has received an Honorable Mention at the Writers of the Future contest. No, but I talk to the Muses that inspire them, and brainstorm with them about the coming story! 😉 The Muses are actors, so it’s like writing a screenplay for them and discussing it with them and they may ask questions about the character they’re about to play and things like that… And I used to put myself as a character in stories as well – not so much anymore, but until ten years ago… I felt an actress too! Love what you do. Keep learning. Keep reading. Keep writing. Keep telling stories to entertain yourself. I’m not successful by any other standards but mine – I can see my growth in the publishing industry, and even though it’s slower than I want it to be, I keep writing. And publishing. Long term thinking, guys. How do you see yourself in 10 years? 20? Dream big, but set realistic goals! I was always scared of legalese and contracts, so when the ebook revolution happened, I thought it was a good way to keep control on my writing and have some fun. I did most of my first covers, then I started hiring artists. I still haven’t recouped the expenses, but ebooks are forever, and I’m adding printed books to the catalog, so… I’m all set to be a micro-publisher in the 21st century! It’s shifting, but it’s not going to vanish. I’ll still be writing 10 or 20 years from now, but maybe there will be other ways to put my stories out there. It’s a steep learning curve, but if I can do it at 50, so can younger writers more used to technology than I am. I grew up with typewriters after all! I’m sure I’ll figure out a way to send my paper books into bookstores and will keep selling ebooks on all major (and some minor) retailers all over the world. It’s a global market now… and even though it’s easy to get lost in this big ugly ocean, just keep your eyes on that lighthouse, and you’ll reach the promised land! As a reader, I love ebooks for fiction, but I still buy physical books for comics, artbooks – and non-fiction. Most of my research is done online, since I live in a non-English-speaking country (so no library to go to), but my bookshelves are full and I’m very happy to keep novels on my Kindle or hard-drive – unless it’s a physical copy signed by the author!